Order at any time and always receive Fast and Free Delivery on all orders anywhere in the world. 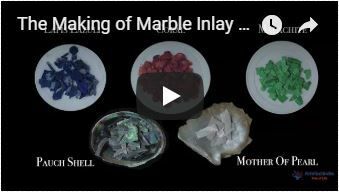 Watch the video of making of marble inlay products. Want a custom made marble product? Click Here to provide us the specifications. Thank you. Your Information has been submitted successfully. We will get in touch with you shortly by your Email/Phone. Marble inlay handicrafts are handmade products, colors of semiprecious stones & marble used may slightly vary from the image shown. Exclusive Octagonal White Marble Side Table is fully handmade inlaid with the different types of semiprecious stones. The semiprecious stone inlaid into the table top are Yellow Pearl, Mother of Pearl and Pauch Shell. The handmade Octagonal White Marble Side Table is made by artisan Daud. The white marble is from makrana it is the same place where we got the marble for the Taj Mahal in Agra India. The manufacturing time of table top is appx. 1 months. The size of the table top is 18 x 18 inch. This can be used as a side table, corner table, end table etc. We will give complementary wooden legs stand and display stand with the table top. The unique quality of the white marble is that its translucent with the light, you can see in the 2nd image. The table top is made in Agra India fully handmade. The Octagonal White Marble Side Table will be delivered by Fedex or Dhl free of cost door to door. If there is any local tax,custom duties or Vat will be paid by the buyer at the destination. The parcel is dispatch with proper packing fully insured covering all kind of risk. To maintain the table top simply clean it with soap, water and dry cotton cloth. It is an art piece which will be a beauty the conversation pcs at home. If You Are Looking Something Customize, Let Us Know We Will Make For You As Per Your Design, Size and Shape. Natural materials like albaster is chiseled and finished into perfection to give you the most exquis.. Bedside White Marble Table Top Inlaid With Semi Precious Gemstones Fine Inlay Art Work By Indian Art..
An Indian Pietra Dura White Marble Plate inlaid with semiprecious stone Paua Shell, Carnelian and Ja..
12'' X 12 '' Antique Marble Handmade Fruit Bowl to Decor Your HomeSize- 12" x 12" InchesThe semiprec.. The handmade white marble inlaid semiprecious stone chess table top is made by our artisans. The whi.. Flower Decorative Jewelry Box Inlaid Lapislazuli GemstoneSize: 4 x 4 InchesThis Decorative Jewe..
Vintage Black Marble Chess Set Inlaid Semi Precious StonesThe handmade Black marble inlaid..
My beautiful marble table with several Buddhist, ritual pieces on it sits beside my chair, so that I can enjoy it always. Love the table! Thank you so much I received Beautiful marble inlay table top, wonderful floral work. Good morning We have received a beautiful art piece of marble elephant statue both are gorgeous. I appreciate your inlay work, fast shipping and safe arrived. Thank you so much for sending our goods. we have just received it today. i am very pleased to meet you guys and dealing business with you. good luck and hopefully i will see you again one day. Dear Sir, We have received our chess set today and we are SO SO HAPPY!! The chess set is indeed more beautiful that we remember. The size is great. The chess pieces are beautiful. Thanks so much!! . We are the manufacturer, wholesaler, retailer and exporter of various marble inlay products in Agra, Uttar Pradesh, India. Copyright © 2018, M K Handicrafts. All Rights Reserved.